This high efficiency distillation system can be equipped with two different types of distillation columns, spinning band columns and packed columns. Traditional packed distillation columns are used for applications that require high distillation rates or that require boiler sizes larger than 50 liters. A variety of distillation column packing types are available including various random and structured packing. Packing materials can be made of metal, ceramic or glass. Materials that have very high boiling points or are subject to thermal degradation should be distilled at reduced pressures. 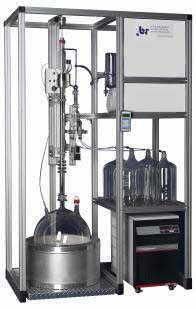 The VAC-1000 is a complete, stand alone, vacuum system that can provide regulated vacuum to any distillation system. It features a 5 decade pressure sensor, control valve, cold trap, vacuum pump, all mounted on a roll around cart for easy maneuverability in the laboratory. Two, four and 8 place fraction collectors are available to direct distilled material to the desired receiver. 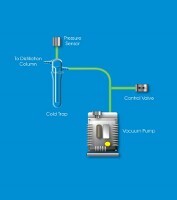 Automated versions allow distilled fractions to be collected unattended. Various size receivers are available in glass, stainless steel and plastic.